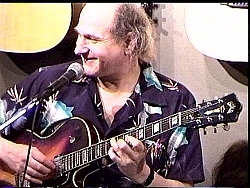 Ted Greene wrote one of the first widely popular books about chord melody guitar. Chord Chemistry was groundbreaking in it's day. It starts at square one with the chromatic scale, and takes you through an explanation of the major scale, chord formulas, ear training, chord substitutions, the cycle of 5ths,triads, chord charts and voice leading. There is enough material here for years of study. The problem is, this huge an amount of information can be scary. Some people will look at Chord Chemistry and think "no way". I also had a problem with the handwritten looking chord charts. Some pages have over 100 chord diagrams. It gets tough to read. Some of the chord forms would have a practical use. Some of them, though, look like they were put in just to be thorough. They would be difficult to play for anyone that didn't have really large hands. There are some real standout parts of the book. I found the pages on ear training to be well thought out. There is also a good section on moving chord forms up and down a 4th. Section 11 - Chord Substitutions and General Information - has enough information in it to keep you busy for a year. Very good information on what to substitute for what and when to substitute it. Ted Greene's Chord Chemistry is a classic. It's filled with great information that will help any player. The player may have to do a lot of digging to get to some of the info.